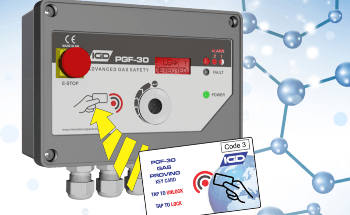 The 2-wire gas detection systems from IGD are faster and cheaper to install. These systems utilize 2-Core cables for both communication and power. This minimizes the number of cable cores and eventually cuts down on installation cost. Cable cores on IGD 2-wire systems do not have polarity. This minimizes the possibility of mis-connection and also speeds up the installation time. Installation costs can be reduced by as much as 70% when IGD’s 2-wire gas detection systems are used. The 2-wire gas detection system offers maximum flexibility during installation and also for future expansion. 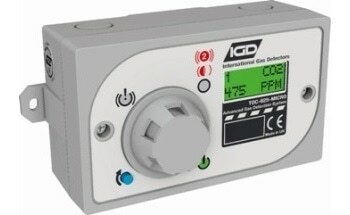 Never under specified IGD’s detector ‘nodes‘ are more than just gas detectors. 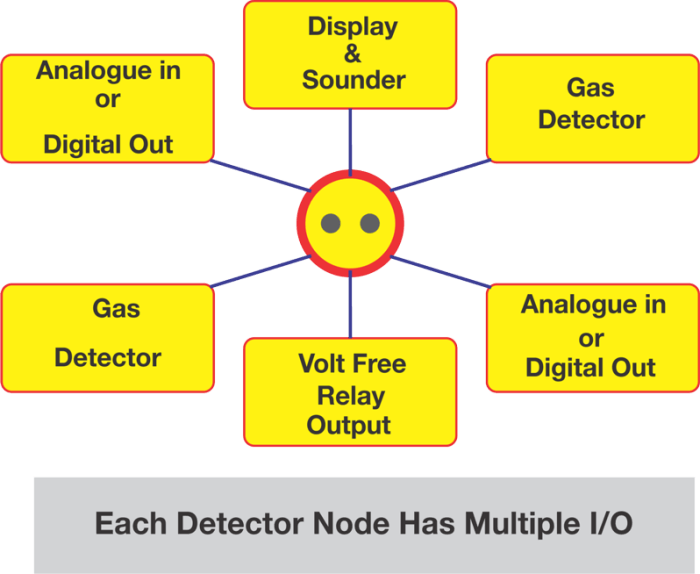 Every single detection ‘Node‘ operates as a gas detector and also comprises of multiple I/O points. This offers maximum flexibility during installation when requirements may differ. This places control where needed without the additional installation cost. It is possible to supply detector nodes supplied for both ATEX or Safe Area operations. 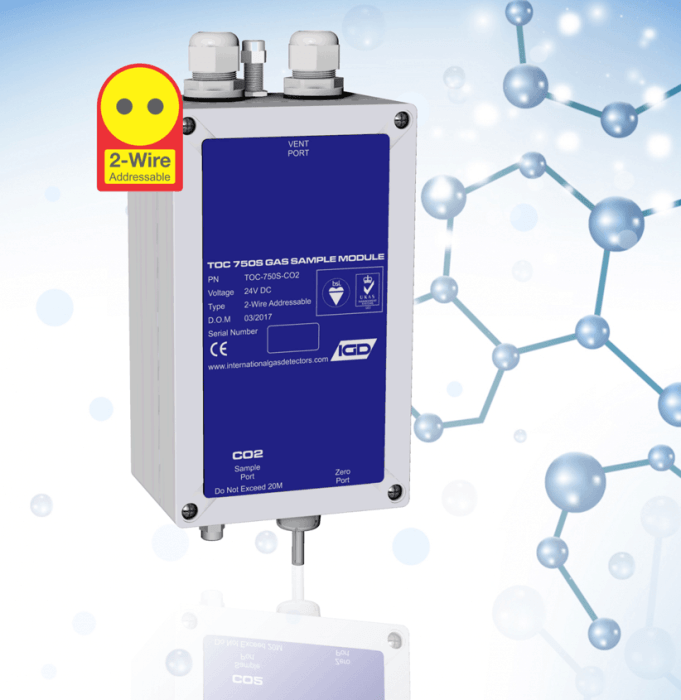 The 2-Wire System controllers from IGD offer best value for performance and money. IGD’s 2-wire controllers are considered to be truly ground breaking with the availability of up to 350 channels. Communication is possible up to 3000 M.
Display options are also possible. A color LCD display and jog wheel interface is considered to be perfect for simpler systems or where minimal intervention is needed. A complete color touch screen option with visually spectacular graphics presents details in a format that can be easily understood. It is possible to plug either display into the hub card permitting an effortless upgrade path from one system to the other. 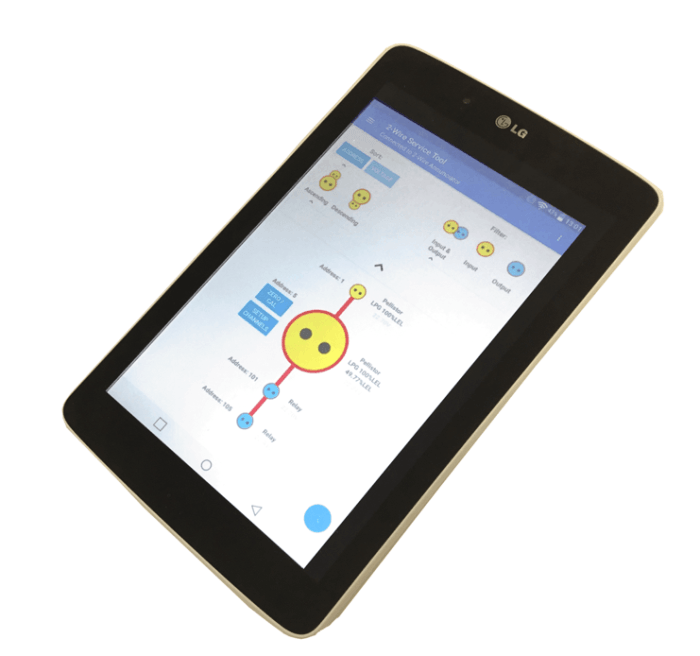 The hub is capable of supporting both displays at the same time enabling the color touch screen to be remote from the controller by up to 1000M. A remote display is easily configured in this manner. 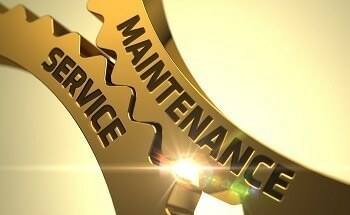 App based service tools for improved efficiency. Site time is expensive and so IGD’s app based service tools allow users to interrogate setup, calibrate, diagnose and save data without resorting to pen and paper. Data can be emailed straight from the app in order to flawlessly record calibration and setup data or download recorded events. 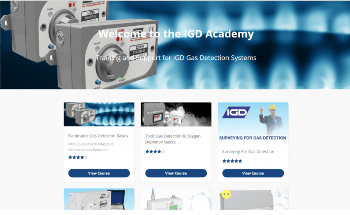 IGD’s range of apps can be downloaded from the Google Play Store. IGD 2-wire sampling systems enable simplifying the process of locating detectors in areas that are hard to access. 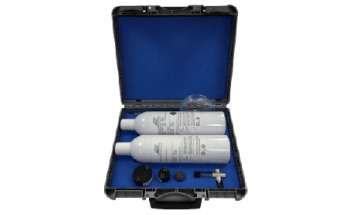 In some instances, it can be a strenuous task to get a gas detector in the right place. Height restrictions may complicate the task of accessing a detector for servicing. The environment may mean it is impossible to get a standard gas detector into the desired position. This could be true of a number of applications including; sumps, clean rooms or areas that are subject to sterilization or frequent wash down. IGD’s 2-wire provides the solution to this in the form of the 2-wire sampling system. IGD’s sampling system allows placing the detector in the most convenient location. Sample points can be up to 20 M away using 6 mm tubing. It is possible to set the sampling system to auto Zero or calibrate (for oxygen detection). Flow is regularly monitored, both the sample and auxiliary port are made up of built in digital manometers. These are used to monitor for system blockages, calculate flow and pressure compensate the detector. The use of piezo technology means a long service life with little maintenance and virtually no moving parts. Samplers can be incorporated onto the same 2-Core cable running as normal detector nodes. 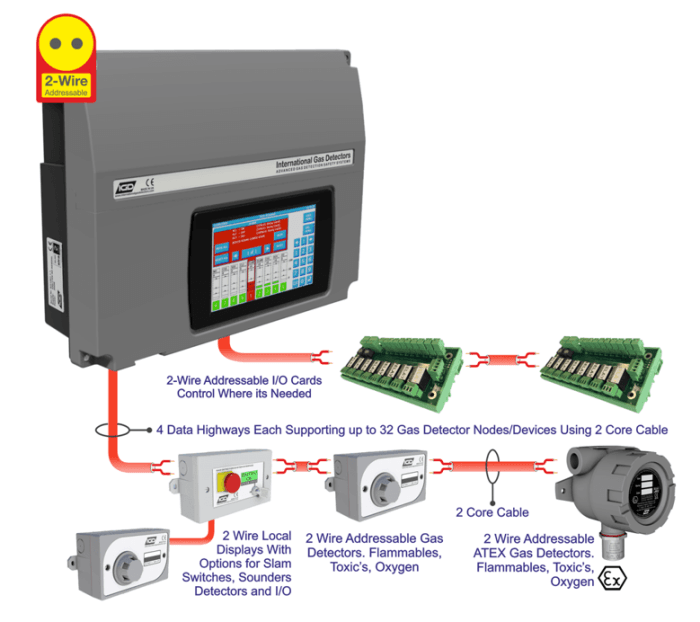 Easily build gas detection networks. Where more than one controller is needed for a process area, multi floor building or complex, 2-Wire systems provide the solution. It is possible to cascade controllers in a master slave network of up to 9 units. This puts control units where needed while maintaining an overall master controller. It is then possible to easily integrate this to other management systems using the controllers Modbus interface. Laser engraved signage for warning signs, ‘What to do in Event or Alarm’ Signs etc.